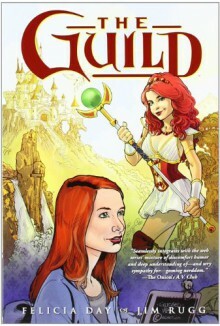 Internet phenomenon The Guild comes to comics, courtesy of series creator, writer, and star Felicia Day (Dr. Horrible's Sing-Along Blog)! Chronicling the hilarious on- and offline lives of a group of Internet role-playing gamers, the Knights of Good, The Guild has become a cult hit, and is the winner of numerous awards from SXSW, YouTube, Yahoo, and the Streamys. Now, Day brings the wit and heart of the show to this graphic-novel prequel. In this origin tale of the Knights of Good, we learn about Cyd's life before joining the guild, how she became Codex, her awful breakup with boyfriend Trevor, and how she began to meet the other players who would eventually become her teammates.